The ailing Big Three automakers  General Motors, Chrysler, and Ford  could have their $14 billion, Corker said on Friday, so long as they agreed to lower the wages and to discontinue various other obligations to their workers, including various contractually arranged unemployment benefits. All these reductions by March 31 and to a benefits level equivalent to what employees of foreign-owned automakers were entitled. Otherwise, the Big Three would be forced to take bankruptcy, meaning that restructuring wold render their pre-existing labor-management agreements null and void, in any case. In other words, take the deal and bust your own unions. Or leave the deal, and well bust them for you. The provisional rescue package was suddenly ancient history as negotiations on the floor broke down. There matters stood, and part of the fallout was that Bob Corker, who had acquired a reputation as a reasonable centrist, was suddenly recast as an arch-foe of labor and a hardline obstructionist. An ominous coincidence was that Volkswagen, one of the foreign automakers that presumably would profit from a weakening (or worse) of the Big Three is about to build a new plan in Corkers own back yard of Chattanooga and that two other foreign manufacturers already had plants in the state. Never mind that, as 9th District congressman pointed out in a speech to the Memphis Rotary Club on Monday, a shutdown in the states one General Motors plant, at Spring Hill, would be a serious blow to Tennessees revenue base. Never mind, too, that a shutdown to the Big Three nationally would create such economic havoc in the world of automotive suppliers not to mention in the economy at large  as to penalize the interests of VW, Nissan, Honda, and whomever else. In a curious way, then we are grateful for a constituent service performed for us here in Tennessee by a senator from another state. That would be Carl Levin, the veteran Democrat from Michigan, home state of the Big Three automakers, who, on a Sunday talk show, did what he could to absolve Corker of excessive partisanship and, worse, of a contemptuous attitude toward a vital sector of the American workforce. 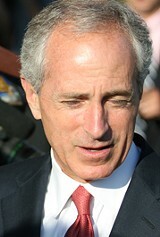 Appearing on the program along with Corker, who contended that the recommendations hed started with were hardened by other members of the Republican caucus, Levin agreed that, as originally formulated, Corkers plan had been helpful and lacked the hard and fast demands and timetables it ended up with. Fine and dandy, and even finer and dandier that President Bush will evidently complete the automakers bailout from funds already set aside for the larger financial bailout. Bob Corker should breathe a sigh of relief like the rest of us. But henceforth he should be more careful about the company he keeps. And about sticking to both his blueprints and his principles.